Tornadoes Hit In Oklahoma City Area; Mother, Baby Killed : The Two-Way The National Weather Service issues a tornado emergency and reports a twister moving east from El Reno toward the state capital. This ominous-looking wall of clouds formed near Purcell, Okla., on Thursday. There were more tornadoes in Oklahoma and Arkansas as severe weather continued to pummel those states. The Associated Press is reporting that the Oklahoma medical examiner's office says 5 people have been killed in the tornado outbreak in the Oklahoma suburbs. A mother and baby were killed in the Oklahoma City area during the storm, the Associated Press reports, citing the Oklahoma Highway Patrol. "Highway Patrol Trooper Betsy Randolph says troopers found the bodies in a vehicle along Interstate 40 west of the city Friday. "Tornadoes slammed Oklahoma City and its suburbs, crumbling cars and tractor-trailers." The Oklahoma Highway Patrol says some motorists have been injured in the storms and others are missing, but has not given specific numbers. The National Weather Service in Norman, Okla., says it is tracking "a large and extremely dangerous tornado 6 miles southeast of El Reno. The emergency covers Oklahoma City, as well as Moore, which was hit by a massive EF-5 tornado last week that killed 24 people. NWS calls it a "life threatening situation" and warns people to get underground if possible. KFOR described the tornado as "a mile wide." 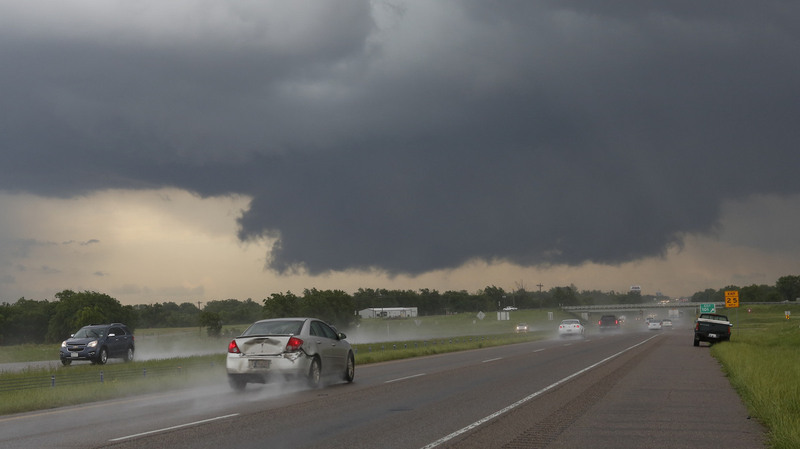 The Associated Press says damage was reported south of Interstate 40 near El Reno after the twister swept through, but that so far there had been no reports of injuries. It said several funnels had touched down south of El Reno, 25 miles west of Oklahoma City. The Oklahoma Highway Patrol has closed I-40 in Oklahoma City and issued a warning for motorists to exit the interstate and seek shelter. Trooper Betsy Randolph told the AP that numerous vehicles were damaged in the storm and that many motorists are stranded. KWTV reports that about 1,200 people were sheltered at Will Rogers Airport in Oklahoma City, which halted operations due to the storm. The National Weather Service is warning — as it has each day for the past couple weeks — that there could be dangerous storms across much of the nation's mid-section. Where to be on alert: "From northwest Texas to the Great Lakes," with the potential for "tornadoes, large hail and damaging winds from central Oklahoma to parts of the Ozarks Friday afternoon and evening." On Thursday, according to The Weather Channel, "at least three tornadoes touched down in Oklahoma, including one in Tulsa, and two more hit Arkansas. ... At least nine people were injured." Looking ahead, the National Weather Service expects strong storms will strike again on Saturday from Texas up to the Great Lakes, and predicts there will at least be thunderstorms across an even wider swath of the eastern half of the nation. There isn't any relief expected for the states that have suffered the most in recent weeks — most notably Oklahoma — until Sunday.